Free parking is available in the Lee Street and 11th Street parking garages. Validate your green parking ticket when you check in for your appointment. Free shuttle service runs between the West Complex and other UVA medical buildings, certain parking lots, and guest lodging. Get shuttle information. To meet with one of the world-class plastic surgeons at UVA Plastic Surgery in Charlottesville, request a consultation online or call (434) 924-1234. 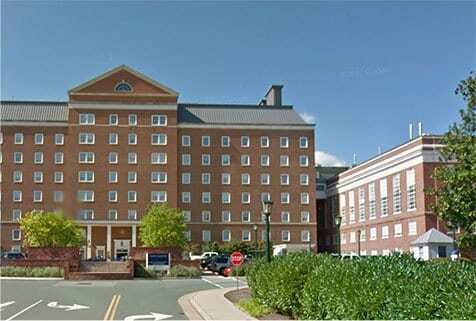 Our Charlottesville facility is located in the West Complex of the University of Virginia Campus. Here our world-class plastic surgeons provide a comprehensive range of cosmetic and reconstructive surgery procedures. Patients can also choose from a variety of nonsurgical procedures such as BOTOX® Cosmetic and KYBELLA® administered by our plastic surgeons at this location. Outpatient surgery is performed at the state-of-the-art UVA Outpatient Surgery Center located in the Battle Building on the University of Virginia Health System Campus. This facility offers complimentary valet parking for convenient access to the surgery center. Take I-95 N toward Charlottesville and Washington, D.C. for about 3.5 miles. Keep right at the fork to continue on I-64 W, follow the signs for I-64 W/I-195 S/Powhite Parkway/Charlottesville. Travel approximately 65 miles north. Take exit 121 for VA-20 toward Charlottesville/Scottsville. Moose’s Restaurant is on the right. Turn left onto Elliott Avenue. Sojourner’s Church will be on your right. Cross 5th Street SW/Ridge Street, and continue as Elliott Avenue becomes Cherry Avenue. Turn right onto Roosevelt Brown Boulevard. Pass Korner Restaurant on the left. Turn left at the light onto Lee Street. Follow the signs for University Hospital. Turn left onto Jefferson Park Avenue. Follow the signs to the West Complex. Take I-66 W for about 30 miles. Take exit 43A onto US-29 toward Gainesville, Warrenton. Keep left onto Lee Highway for about 30 miles. Continue onto James Monroe Highway S for approximately 40 miles. Keep left toward US-29 Bus S.
Continue onto Jefferson Park Avenue. Follow the signs to the West Complex. Take US-29 N towards Amherst for approximately 60 miles. Take the exit towards Charlottesville, Fontaine Research Park. Turn right onto Fontaine Avenue toward Charlottesville. University of VA Medical Center will be on your right. Keep right onto Jefferson Park Avenue. Follow the signs to the West Complex.